A loan of $2,175 helped a member packaging for her next harvest. This photo was taken at the nursery of Mrs.Ana Isabel B. C., who is a member of the Las Alegres (Happy Women) group that meets in Tenancingo, Edo Mex. Also in the photo are shoots of the “Alcatraz” plants that she grows. She grows and sells flowers since she is a flower-grower. She began this business six years ago with the help of her husband and now with that of her children, supporting the family with the earnings from this business. She will use the loan to invest in packing materials for her next harvest, since she says that is the most important thing because in this way the flowers stay fresher and live longer. Her customers have the same opinion; they say they are looking for better packaging. She is well-known in flower sales for her attituD. about selling; she is an aggressive businesswoman because of the effort she puts into her sales. She always shows the happiness that characterizes her. This is the true reason for naming the group Las Alegres. In the photo, Ana Isabel is the first woman from left to right, wearing a short-sleeved white shirt and blue pants. She is 28 years old and studied only through the second year of elementary school. She has three children. They are Herendirá R., who is 11 and in elementary school, Gabriel R. who is 7 and in the third year of elementary school, and Marco R. who is 6 and will begin elementary school this year. She is married to Eustolio V. M., who is 42. He works in greenhouse and nursery construction, and for them success lies in being all together as a family and helping each other. Ma. del Carmen W. M.
Esta foto fue tomada en el invernadero D. la señora Ana Isabel B. C. que es integrante del grupo Las Alegres que se reúne en Tenancingo, Edo Mex. Y en la cual se ven los brotes D. las plantas D. nombre “Alcatraz” que ella cultiva. Ella se dedica a la siembra y venta D. flores pues es floricultora, este negocio lo inició hace ya 6 años con la ayuda D. su marido y hoy la D. sus hijos manteniendose D. las ganancias D. este negocio. Su préstamo lo utilizará para invertir en el empaque D. su próxima cosecha, ya que según comenta es lo más importante por que D. esa manera se conservan en mejor estado y se mantienen con más vida sus flores. Sus clientes opinan lo mismo, dicen que lo que buscan es un mejor empaque y ella es conocida en la venta D. las flores por su actitud al vender, es una comerciante agresiva debido al empeño que pone a sus ventas. Ella siempre muestra la alegría que la caracteriza esa es la verdadera razón del nombre del grupo Las Alegres. En la foto es la primera señora D. izquierda a derecha, D. camiseta blanca corta y pantalón azul. Tiene 28 años y estudio solo hasta segundo D. primaria tiene 3 hijos ellos son Herendirá R., D. 11 años y esta en la primaria, Gabriel R. D. 7 años y esta en 3ero D. primaria y Marco R. D. 6 años y este año entrara a la primaria, esta casada con Eustolio V. M. D. 42 años el se dedica a la construcción D. estructuras para invernadero y para ellos el éxito consiste en estar todos juntos como familia ayudándose. El grupo esta conformado por 10 integrantes que son: Ana Isabel B.C. Edén H. D. J. Lilia A. C. María Teresita M. H. Fátima G. W. Luz María E. G. Romelia H. E. Victoria B. M. Candelaria M. A. Ma. del Carmen W. M.
This loan is administered by CrediComun, a Kiva Field Partner since February 2010. 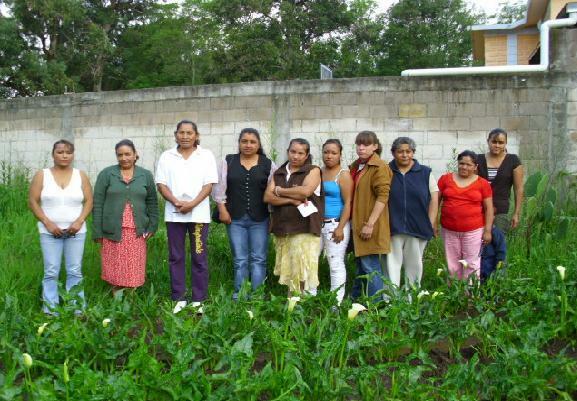 CrediComun is dedicated to providing loans to groups of women in rural areas in Mexico, and is beginning to lend to individuals as well. One of its newest branch offices is in Ciudad Neza, a poor suburb on the outskirts of Mexico City. CrediComun has grown rapidly since its inception in 2005, with 37 branch offices and over 350 employees, and was ranked the 12th best microfinance institution in Latin America in 2010 according to the Microfinance Information Exchange (MIX). For more information on CrediComun, please visit its partner page. If you would like to support CrediComun and its borrowers, please visit its lending team. CrediComun was founded in 2005 and currently operates 24 branch offices in 10 states. CrediComun lends primarily to women and is focused on providing their clients with highly targeted loan products. They are currently piloting social programs that include mobile medical services and market access for their clients artisanal products. CrediComun is actively trying to combat the exorbitant operational costs associated with doing business in Mexico through technological innovation aimed at increasing efficiency and lowering costs. These high operational costs in Mexico account for the higher interest rates in this region. Credicomun’s interest rate, while they appear high, are in line with the average in Mexico. In addition, Credicomun returns up to 50% of the interest charged to borrowers who pay on time. Also, Credicomun serves primarily serves rural borrowers (70% of their portfolio is rural) with very small loan sizes (about 4% of GNI per capita), which are much more expensive, thus driving up the interest rate. Kiva funds are supporting the further expansion of CrediComun’s social and technological initiatives.